Singer/songwriter Sara Bareilles is known for her wistful vocal brilliance and engaging, piano-driven sound. 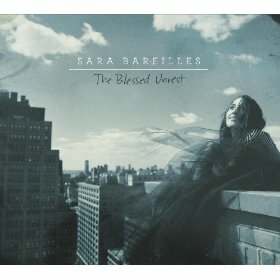 Her new album, The Blessed Unrest, plays evenly within that formula ushering in hints of jazz and rock, but mostly pop. When her songs tend to fold out into ballads such as on “Manhattan,” which singles out heartbreak or on the pop-infused anthem of empowerment, “Brave,” it is undeniable that Bareilles is a rare and gifted force. She easily wields power on some songs that feel like torrential downpours and others that are as light and endearing as a soft breeze. The upbeat rhythmic “I Choose You,” features beautiful unconventional sonic textures. Even on a song such as “Hercules,” the rough and tumble rhythm feels so glorious under a multi-layered chorus and a playful, mischievous piano riff as she sings, “There is a war inside my heart gone silent/Both sides dissatisfied and somewhat violent/The issue I have now begun to see/I am the only lonely casualty.” This kind of unabashed lyricism against the backdrop of rich pop melodies will always grow hearts, minds and listeners.